Last month, we told you about proposed legislation in New Jersey that would make it possible for cops to fine someone $50 for texting and walking, or have them tossed in the slammer for 15-days. Other states are following suit. While U.S. lawmakers are trying to pass laws that make a criminal out of those who text while crossing a busy intersection, a city in Germany is taking a different tact by bending over backwards to those who are constantly looking down at their screens. In the German city of Augsburg, the residents recently mourned the death of a 15-year old girl who was killed by a tram while looking down at her smartphone. Even before that tragedy, it became obvious to everyone in the city that pedestrians were all looking down at their handsets while crossing the street. Instead of passing a law that would make such acts illegal, the city had a better idea. 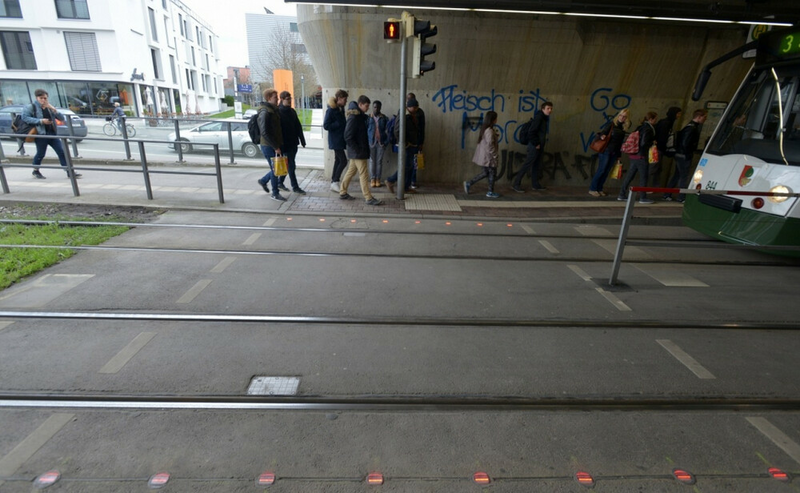 They embedded traffic lights into the pavement by two tram stops. This way, those looking down at their smartphone screens are sure to see the status of the traffic light as they are about to cross an intersection. This approach is bound to save some lives. New research shows that 20% of pedestrians in major European cities are distracted by their handset as they mosey along the road. The problem in the states is even worse as 33% are texting or working on their smartphone at dangerous intersections. Two years ago, the Chinese city of Chongqing thought that they had a solution to these smombies (a combination of the word smartphone and the word zombies). The city tested the division of a 165 foot stretch of sidewalk into two halves. One would be used for those walking in the normal manner. The other side was reserved for those walking with their heads down, staring at their phones. Leave it to the U.S. though, to come up with a legislative approach when something more innovative might work better. Not necessarily better. Just different. U.S just copy Germany and your good to go..or embed traffic lights on android devices. Providing good solutions instead of just making everything illegal, that's Germany folks! Its not a good solution. The best solution is let them die. Why spend money on people who dont care enough about their lives to put the phone down for 10 secs to cross a busy street. Death is what they deserve. It is a good solution to something they considered an important enough problem, now you and I can complain about whether they deserve it or not, but that would not be relevant! US you better learn from your uncle Germany. NO! They need to let them all die. I usually stand off to the side when I interact with my phone, and try to walk as little as possible. However, if I do walk and text, I'll hold my phone up as close to eye level as possible. It serves two purposes; One, I can see where I'm going. Two, it promotes good posture. Don't want to be hunched over like grandpa. I'm OK with making it illegal (not with jail time but with traffic violation tickets). Why should money be spent to install extra lights on the sidewalk or to paint lanes on the sidewalk to have one for people walking and looking down on their phone? Make these idiots pay fines for using their phone looking down on it while crossing the street. Or just let them die. It takes 10 secs to cross a street. If you cant give up 10 secs, to not pay attention to your phone, then you deserve to die. Typical America trying to profit by making crimes out of everything possible so the authorities can profit instead of helping to fix the underlying problem. This is what you get in the land of the "free" where all it actually means is the government is free to impose ridiculous laws onto the people.